I don't-- as a general rule-- add a lot of "new" elements to my designs. 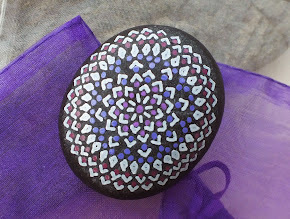 Most of the time, the designs are merely variations on something I have tried before. Recently, I had this idea that I wanted to incorporate spirals into the designs. I wasn't sure exactly how I was going to accomplish that... and not end up with something that felt not only contrived, but like I was floating too far away from the original designs inside my head... perhaps doing so only in the name of "novelty seeking," rather than because it genuinely felt right. I spent several weeks turning over the idea of just how to incorporate spirals-- a basically round design element-- into patterns that are largely angular and linear. Eventually, I came to the conclusion that I was better off adding the spirals as "accents," rather than incorporating them directly into the pattern designs. 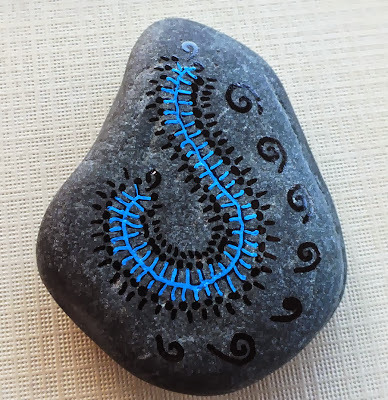 Not many stones lend themselves to having spirals added-- on this stone, they seem to echo the basic "question mark" shape of the main design. Not sure I am going to try this again, but it has since occurred to me that a string design in a spiral shape might be viable.